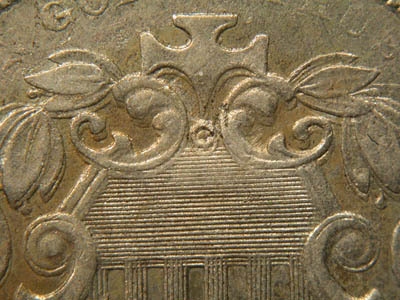 This 1872 is unlisted in any reference book, but is possibly the wildest combination variety in the entire shield nickel series. This top photo shows a fairly dramatic doubled die to the southwest. The date is where things really get wild. There is a repunched 2 between the 7 and the 2. 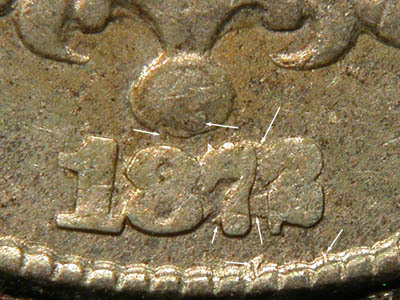 There is possibly a misplaced date in the denticles. And to top it all off, there is a misplaced 2 smack on top of the ball. The left foot of this misplaced 2 can easily be seen at the bottom of the ball, and the right base of the 2 can be seen on the ball. 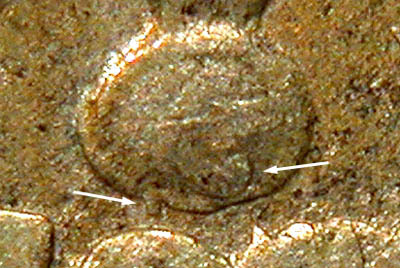 A tight shot focussed on the ball of this variety, image enhanced to better show the misplaced date on the ball.